As you might have already noticed, dear follower, this blog post is in English. The reason is that I intend to force my English speaking and US based friend, Aaron to read these particular blog posts that I am writing from his country. I'm in New York City, so of course I'm drinking Budweiser. I enjoy some very fine blues music while I drink it, and some new Danish colleagues who are also in town for work (as am I). 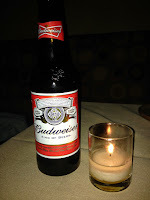 The blues was undoubtfully more interesting than the beer. Budweiser is just one of those really plane beers. Like a 'could I care less'-beer. A 'whatever'-beer. I mean its not bad or anything - but if the beer was a conversation, I would have fallen asleep, and not even be embarrassed about it because I would blame the boredom. And its label as 'King of Beers' is nothing but amusing... As if. 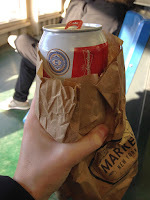 Luckily for this particular beer, I drank it again a few days later out of a brown paper bag on the Staten Island Ferry, and living up to all this American awesomeness, it actually tasted a bit better.